This sad and touching story is written by 13-year-old Mays Abu Rass – the daughter of Walid Abu Rass, who was taken from his home in Ramallah on November 22nd 2011 by the Israeli occupation forces. Walid has been held since then in ‘Administrative Detention’, which means that he is detained without charge, and that neither he nor his family nor his lawyer can find out why. Read Walid’s full story here on his friend, Sam Bahour’s blog, and write a letter of support. 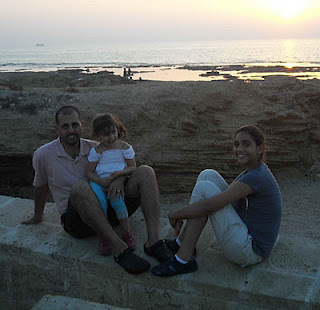 Happier days: Walid Abu Rass with his daughters (Malak, 4 years old, and Mays, 13). Filed under israel and palestine articles by Father Dave on Feb 5th, 2012.